Some of the most common decor mistakes are made when planning a small room, in fact, not just the bedroom. Too often we attempt to miniaturize the room’s contents, to scale everything down, in the mistaken belief that bedroom furniture and accessories will make a little room look larger. While you can always scale up, it is far more difficult to scale down and when decorating a small space, large, confident pieces work far better than those of dolls’ house dimensions. The bed, for example, is a large piece of furniture, often the largest piece of furniture in the room, and it is unproductive to try and minimize its impact. Amongst the many small bedroom decor tips, treat the bed with élan. Cover it with a bedspread with a simple or brightly colored design, and add pieces of furniture of the same scale in order to balance its bulk. The end result will then be one of comfortable warmth. The bed itself can provide all that you need; new designs often incorporate a headboard that extends into a unit intended to hold lights, books, bottles, and clocks, as well as housing various remote controls. An example will be a high-level bed with plenty of boxes, drawers or cupboards underneath. The cupboards do not have to have doors, which need space to swing open. Instead, think cubby holes for storing books, clothes and shoes. Although these are generally larger than a simple bed, no other furniture will then be needed — and the bed becomes an island of self-sufficiency. Another effective decorative device for a small room is the constructive use of color. Do not automatically follow a bland scheme in the hope that such tones will make the whole space look larger. Instead, follow the same rules used for selecting the furniture — choose colors that will inhabit the area with confidence and this may be either bright and strong, or soft and light, depending on an individual’s taste. Similarly, if you are using pattern, a small bedroom is not the right place to use a small, all-over, or repetitive geometric design, as this will clamor for attention and blind you with its fussiness. The alternative, however, does not have to be an enormous flowing pattern (although that can work well if carried through with confidence): think instead of a medium-size pattern that will add richness and depth, particularly when used as curtains or bed hangings. A small room must, of course, be well organized — clutter is not, & should not be, permitted. I'll share some space-saving ideas. The bed which folds up against the wall is another space-saving alternative. Build storage shelves on the wall above the folded-up bed and hang a blind or curtain which, when extended, will hide the entire wall. Bunk beds which fold away are useful in a child’s room. But you lose the advantage of the copious storage space which can be built in underneath a high-level bed that is a permanent structure. Clothes storage becomes a greater issue in a confined space. Part of the solution is to be disciplined and ruthless about how many pieces you should have. Seasonal storage, where you store away winter clothes in summer and summer for winter, will help the situation if you have an attic or other place to stash away a couple of old suitcases. If you’re a naturally tidy person, consider banishing your wardrobe door which opens out. This is because it shrinks the room visually. Some small bedroom decor tips include removing doors which swing open conventionally and replace with sliding panels, folding doors or a curtain that hangs flat when closed. Maximum use of up-storage is vital and custom furniture built into the available space, is more efficient than free-standing. If your wardrobe finishes short of the ceiling consider extending it upwards to create less-used storage spaces. Take a look also at bedroom storage ideas to achieve an organized space. You should also install enough shelves, drawers, and cupboards, so you can stow everything away. If there’s a lack of window space, one should not attempt to lend them a lightness they do not possess. Here are some small bedroom decor tips that’ll teach you how to use the lack of light to create a cozy, comforting, and warm bedroom. Colors, textures, and furniture should all convey the idea of a womb-like space, a nest into which one can crawl. I’d suggest using matt paint rather than gloss, using warm shades of soft deep pink, ochre yellow, or mole and taupe to create a sophisticated, welcoming, and all-absorbing effect. The picture below left, illustrates this well. 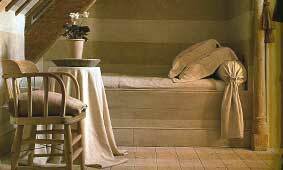 Creamy and buttery color blends well with the worn timber to create a comfortable, lived-in space. This is complemented with matt fabric and texture. For indulgence, you might consider having a fur or faux fur throw or spread on the bed to enhance the coziness (above right). The floor can be carpeted, the lighting subtle and often concealed. Because of space restrictions, beds are often fitted into the most uncomfortable and cramped corners — under the stairs perhaps, or set inside a disused cupboard, or positioned under the eaves in an attic. The key considerations for small bedroom decor tips are to make the most of any architectural feature, which includes a sloping ceiling, exterior stone walls, and any other challenging elements of an interior. An awkward, strangely angled space can always be made interesting by using color in a dramatic way, or through the use of textiles as curtains, drapes, or hangings. Traditionally, particularly in Europe, pattern is used to disguise awkward shapes — a room under the eaves, for example, might have every surface covered in one design, thereby camouflaging sharp or irregular angles.